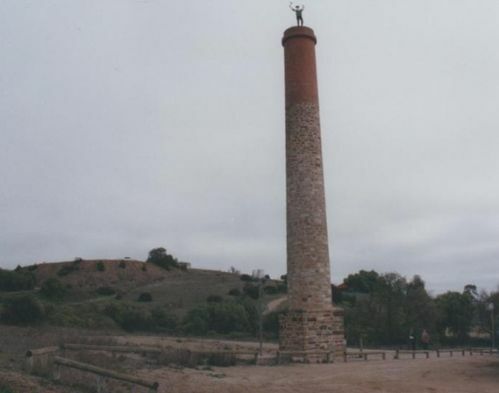 "Johnny Green" mascot of miners since 1852 atop Peack's Chimney is dedicated as a memorial to the "Cousin Jacks and their fellow miners at the Burra Mine". The reopening of the open cut mine in the early 1970`s necessitated the destruction of Peacock`s Chimney, so to the credit of many dedicated and hard working members of the National Trust, the chimney was rebuilt by the National Trust at its present location in 1972.The original Chimney was created to provide an updraught to the boilers at Peacock`s Enginehouse . The Figure at the top of the Chimney is Johnny Green, the mascot of the Burra Miners. Orginally made of wood, its original location was at the top of Roach's Pumphouse until 1855, when it was then replaced with one sheet of iron and put on top of the shears above Morphett's shaft in 1858. In 1925 fire destroyed the timbers of Morphett's Enginehouse and Johnny Green was found amongst the ashes, and then placed on a pole at the Mine entrance until 1967 when vandals cut him down. In 1972 a new Johnny Green was made and placed at the top of Peacock's Chimney.